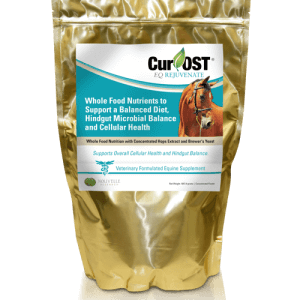 Cur-OST EQ Green General Support Formula with Curcumin 95%, Turmeric Oleoresin extract, Boswellia 65% and Natural Whole-food Herbs To Promote Healthy Inflammation Levels and Nutritional Support in the Up and Coming Equine Athlete. Promotes a healthy stress response. Benefits joints, tendons and muscles in performance and recovery. 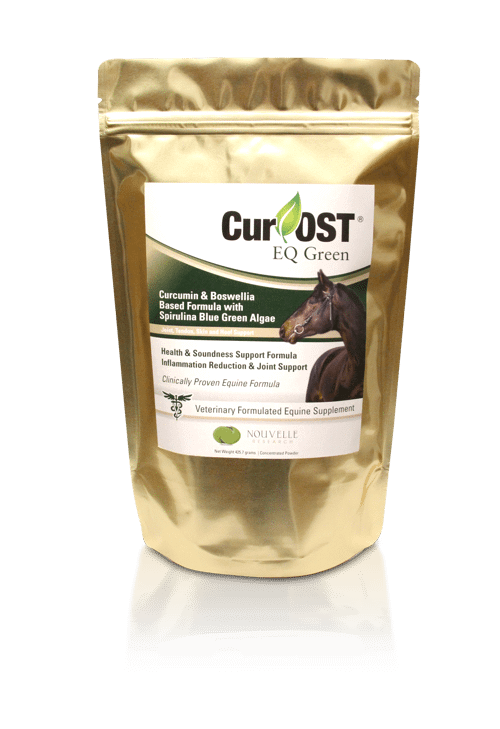 Cur-OST EQ Green provides maintenance levels of Curcumin 95% extract, Turmeric Oleoresin natural oils and curcuminoids with Boswellia and a blend of alfalfa and spirulina blue green algae for nutritional support. Supports a healthy inflammation response while also benefiting joints, tendons, muscle, skin and hoof health. Low level or intermittent inflammatory problems impacting the joints, tendons or muscles? Lack skin luster or overall nourishment? Does your horse need an overall boost of nutrition plus inflammation support? Ideal formula for the up and coming equine athlete to promote overall health and soundness, while undergoing the stress of training and competition. 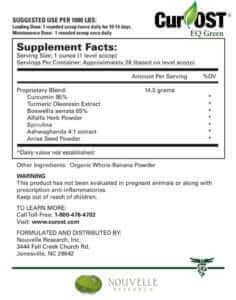 Quite Possibly the ONLY Supplement your horse will require! FACT: Chronic inflammation is affecting your horse everyday, leading to cellular changes, weakening tissues and contributing to joint deterioration. Most supplements do little to impact this inflammation but replace what is being lost as a result of it. SOLUTION: Support a healthy inflammation response and minimize the impact to enhance overall health and improve joint function beyond traditional joint supplements. HOW: Curcumin has been demonstrated in research to promote a healthy inflammation response more completely than traditional therapies, by down regulating key enzyme pathways that contribute to the release of many inflammatory proteins that are involved in pain, immune compromise and tissue degeneration. By combining Curcumin with Boswellia and other nutrients, we are able to support a normal level of inflammation effectively and support overall health. 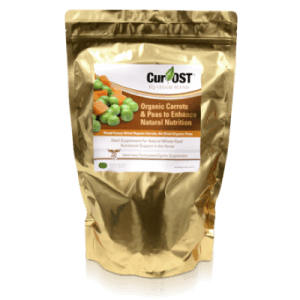 Our Cur-OST EQ Green formula provides LOW LEVEL INFLAMMATION PROTECTION SUPPORT, plus antioxidants, vitamins and minerals in their natural forms thought the use of nutritive herbs including Alfalfa and Spirulina Blue Green Algae. 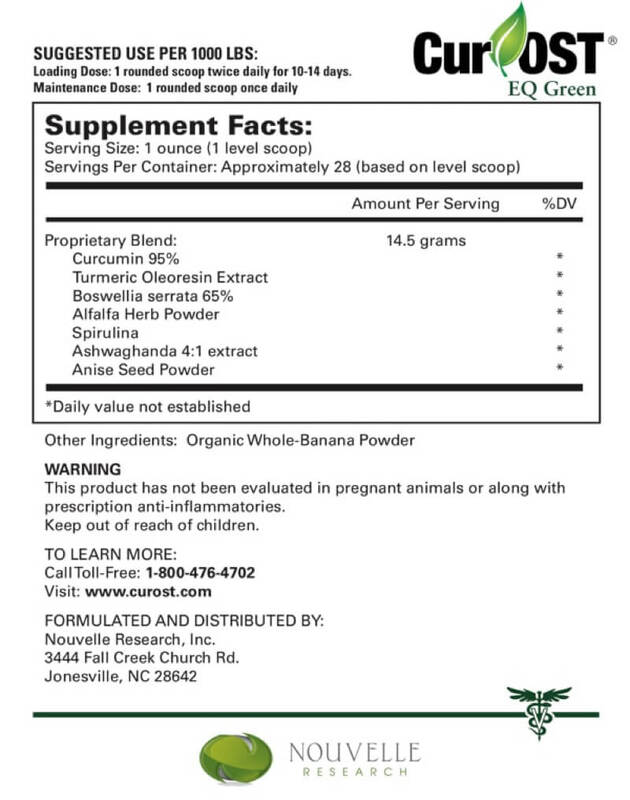 EQ Green is not only a joint supplement for horses, but a complete health supplement. Due to containing high levels of spirulina blue green algae, it is ideal for supporting ovreall skin, hair and hoof health. Curcumin is the active phytochemical in Turmeric (Curcumin longa).The root of the Turmeric plant is the main plant component utilized and contains many beneficial ingredients with medicinal value, but Curcumin is by far the most active. Most supplements utilize Turmeric, but Turmeric only contains 2-4% Curcumin on average and honestly, Curcumin is what we are looking for to benefit health. By using Curcumin, instead of Turmeric, we can reduce our daily dosage and in most cases, obtain much higher health benefits. There has been much discussion about the absorption and bioavailability of Curcumin in human studies, but our research has not shown this to be an issue. We utilize a patented Curcumin product called BCM-95, which combines the 95% Curcumin extract with volatile oils from the Turmeric root and based on research studies, this enhances absorption by up to 7x! BCM-95 Curcumin has also been shown to be more potent than Curcumin with added bioperine, demonstrating higher and more sustained blood levels. Curcumin is fat soluble, so the addition of these natural oils makes sense and simply works better than traditional Curcumin or Turmeric blends. 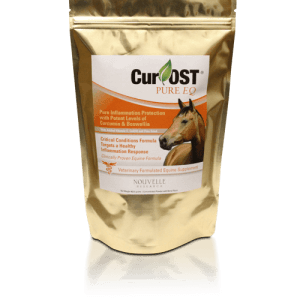 Our Cur-OST formulas provide potent levels of herbs and nutrients that often mimic levels found in human and animal research studies, to produce results clinically for your horse. After all, that is what you are looking for and we understand this. Cur-OST formulas are the only supplements on the market using potent levels of patented BCM-95 curcumin in combination with other critical anti-inflammatory herbs. We don’t just want to provide a product with trace or non-functional levels of a particular ingredient, but we want to provide levels that actually make a difference for your horse. Health is expensive, but we find that with continued use of Cur-OST formulas, many other traditional supplements can be discontinued, which saves you money in the long run and actually yields better results clinically. The goal with equine recovery is to find the formula or combination that helps to produce results, then over the next 6 months, try to reduce the dosage needed or move down to a lesser strength formula that provides similar results. Often we find that down grading formulas is possible once the initial health problem is under control, which again helps to save you money. If we can restore health on many levels, then the overall cost to you as an owner is reduced as hopefully your horse is healthier, stronger and sounder, which requires less visits from the doctor! That is our goal…to restore health! In the Cur-OST research trials conducted at our hospital, we have encountered no negative side effects even at extremely high dosages. We have monitored general health, complete blood chemistry panels as well as cytological parameters in all patients. There have been no negative side effects or alterations in blood panels noted throughout the trial. Cur-OST formulas have been used in patients for over 7 years with no side effects noted. In some instances, there have been reported hypersensitivities to various ingredients, but it is a rarity and not uncommon with any supplement. Based on human research trials, there have been no negative side effects noted in trials up to 3 years in length and at extremely high dosages. Cur-OST has not been evaluated in pregnant animals or animals that are currently lactating. Cur-OST Equine products are supplied in a re-sealable package containing approximately a 28-day supply using a full scoop to the notch inside the rim of the scoop at maintenance levels. It is designed for once daily administration. In moderate to severe conditions, it is recommended to administer an induction dosage of two scoops once daily for 7-14 days, then decrease to one scoop daily for maintenance. Why are your supplement not in pellets? Please contact Dr. Schell directly with any questions that you might have about our Cur-OST Equine formulas by clicking the ‘Orange’ button at the top of the page. You may also view our equine product article HERE, which may help you in deciphering which product is correct. We are also here to assist you by phone by calling 1-800-476-4702. I started the Green formula with zero expectations, I wanted to make sure my 3 year old was starting his performance life off correctly. He was already healthy and happy what more could I need? Wow, the transformation on my ‘healthy’ horse was phenomenal. I didn’t think he could look better! And to know he is getting everything he needs to maintain a healthy career makes it that much more exciting!